Kids love tactile toys. They love goop. They love to stretch and squish and form shapes. Add sparkles, and putty becomes irresistible. Sure there is traditional [amazon_link id=”B003UYTMNE” target=”_blank” ]Silly Putty[/amazon_link]; however, Crazy Aaron has reinvented it for the 21st century in many unique colors and shimmers. 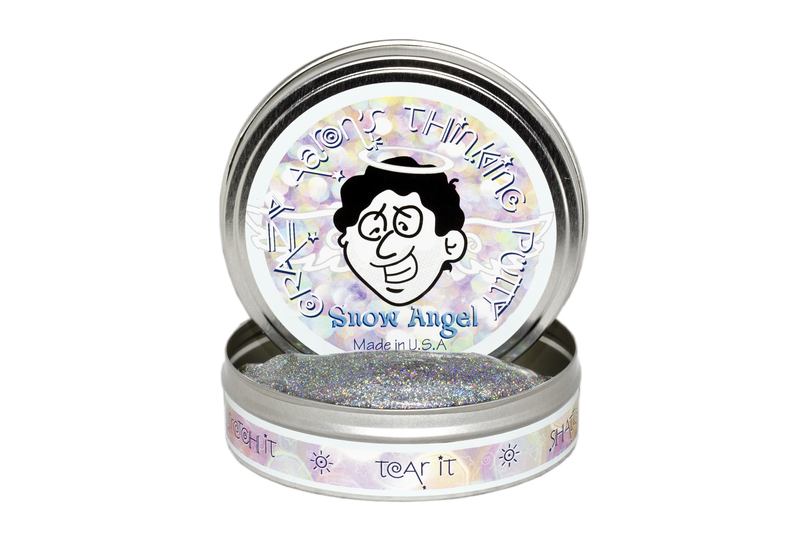 We were sent Crazy Aaron’s Snow Angels Thinking Putty to try. My kids immediately split it in half, as they both were enthralled with it. Available in super Illusions, Putty Creatures, Glow in the Darks, Heat Sensitive’s and more! Can be used as therapy putty to assist with fine motor skills, arthritis, ligament injuries, etc. Thinking Putty is made from silicone in the USA. It holds it’s shape and can be combined to make interesting characters and creatures. It is boundless in possibilities and fun for adults too.